As my world turns, I continue with the crafting. I sure do miss running. I've never had vertigo last so long. Incredibly frustrating. I was surprised to hear that so many of you have experienced vertigo as well. I definitely wouldn't wish it on anyone. 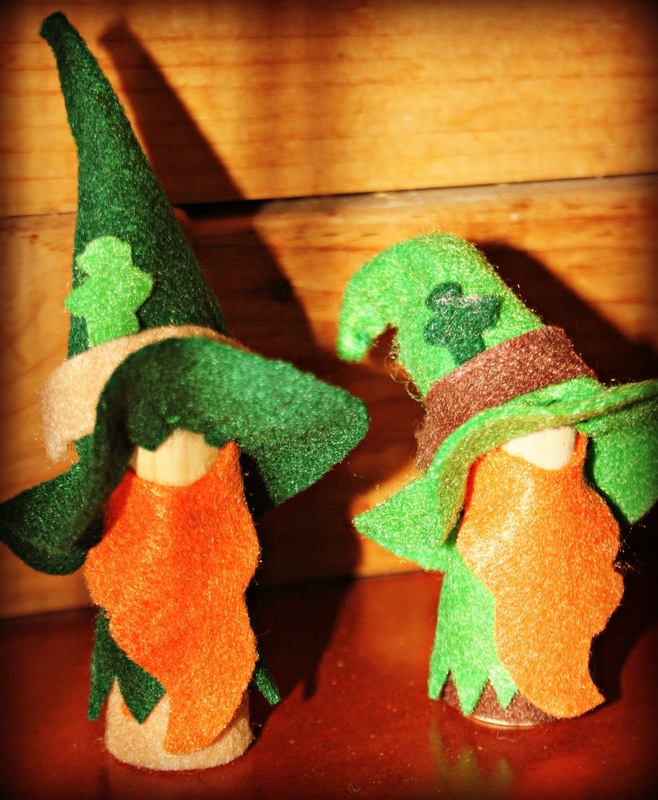 So with St. Patrick's Day just around the corner, I have crafted a set of little leprechauns. Cute, aren't they? Kind of look like they could get up to some mischief in your house though. If you're willing to take the risk of having this duo in your home, click on the Rafflecopter - maybe you could be LUCKY enough to win them! Pattern for these, if you'd like to make your own, can be found at Wee Folk Art. So cute! You are very creative. Well done! Lisa, I am so sorry about your vertigo lasting so long. I've hard it for a few days at a time but nothing too extended. I certainly hope you get some relief soon. I need to teach you to knit or crochet. You could nurse your vertigo and end up with adorable sweaters or hats. Love the little green men :-) Hope you get better soon. What about acupuncture? Cute, Lisa. Sorry about your vertigo... Since I don't participate in Giveaways, please don't put my name on the list. I'll just enjoy them from here. So cute! I love the little green men. You're very creative! I'm sorry you're still struggling with the vertigo. Is it an inner ear problem? Gosh Lisa - that is a long time - hope you get to feeling better soon. Now, those are just too adorable! So sorry about the vertigo; that stinks big time. Very cute! I've had vertigo in the past, and it is NO FUN! In my post today I mentioned that I hadn't been thrifting with my friend Paula in a couple weeks-and guess why? She had terrible vertigo too!!! So sorry this vertigo thing is still hanging around. You must be going nuts not being able to run! Very cute! So sorry the vertigo is still hanging on. Hope you get to feeling better soon. Oh how cute Lisa. I don't have any St Paddys things anymore. My Granddaughter took them last year for her apartment. The vertigo doesn't seem to be affecting your crafting abilities! These are precious. Hope you feel better very soon! oh you are a crafty momma as well!! these are so cute and so well made!! I'm so sorry to read about your problem with vertigo and hope it clears up soon. These little guys are adorable btw! I had vertigo after I had knee surgery.. Oh this is so aweful.. I went to my physical therapist and she told me that I needed to sit on the bed and lay down to the right ~ keep my eyes open and if I was dizzy to keep my eyes focused onto something. If I was not dizzy going to the right I was to do the same thing ~ lay down on your left side.. keep your eyes open and focus is your dizzy on this side.. She said to do this 3 times a day 3 times each.. I was dizzy when I laid on my right side.. After doing this 3 times a day for 3 days it was gone.. Hope this works for you.. Awesome red beards! They look like many folk around here! I'd like to win these for my mother. Sorry your vertigo is hanging around so long. On the bright side you sure are cranking out some super cute crafts. These are adorable. I hope you feel better soon. I bet my daughter in law would like to have them. They are so cute. I hope you get back to normal soon. I have never experienced a bad case of vertigo. Is it totally selfish to want them all for myself? St. Patrick's Day is my favorite holiday of the year! my son would get a kick out of these! Lisa I'm so sorry you are still feeling so blahh. I sure hope that it starts to subside pretty darn quick! My mom! Her birthday is St. Patrick's Day! My little man would absolutely love these... as would my daughter ;) I hope you feel better! I'd like to win these for my daughter.